Q The party you assisted in bringing to power has now completed two years. Do you feel happy about it? It was our attempt to rid the country of Rajapaksa’s rule which no doubt deserved to be removed. We also told the masses not to have faith in the government that would be ushered in after January 08th. This is now proved. It is the moment now for the masses to rally round to safeguard their rights. At the time this government took office there were assurances given to the people; punishment for frauds, acquisition of properties and the establishment of the rule of law. The government is acting in contravention of all the above. Q You worked to overthrow the former regime well aware of the nature of the present government. Why did you put the masses from the frying pan to the fire? At the elections we told the masses very clearly that the government that would be set up after the elections would be a combination of the UNP and the SLFP. Though they campaigned separately, it is their wish to form a unity government after the elections. We informed the public during the August elections about the importance of rallying round the JVP as the SLFP would be providing life blood to the UNP. Q The JVP with only six MPs were considered when appointing a Chief Opposition Whip, instead of appointing a candidate from the Joint Opposition. They have alleged that this appointment was made because the JVP supported the government. What is your response? The Chief Opposition Whip is chosen by the opposition. Only someone lacking basic knowledge would claim that the leader of the opposition and the Chief Opposition Whip are appointed by the ruling party. The ruling party only appoints the leader of the house and the Chief Government Whip. Q Were you selected by the opposition? Only six parties contested the parliamentary elections – the UPFA, UNP, JVP, TNA, SLMC and the EPDP. The UPFA and the UNP form a unity government having come to an agreement. Only three parties represent the opposition, they are namely the TNA, JVP and the EPDP. Even today the group led by Dinesh Gunawardene is considered as members belonging to the UPFA. The time allotted to them is allocated from the time set apart for the UPFA. Dinesh Gunawardene is allowed certain privileges as a leader of a party, as such powers vested on Nimal Siripala De Silva had been bestowed by him on Dinesh Gunawardene. Taking into consideration these factors, out of the three parties representing the opposition the highest number of MPs were from the TNA and accordingly the post of the leader of the opposition was given to that party, and the JVP which received the second highest number of MPs got this post of Chief Opposition Whip. Q From the JVP’s view point, isn’t there any good in present government? When a road is developed or a canal is cut everybody would appreciate them. On that point every government had been good. But this should not be the yard stick to measure every government. It should be based on their economic policies. Chandrika and Mahinda both said that we could obtain loans from abroad and develop the country. They regarded this as a victory. Those who propagated taking loans as a victory now refer to obtaining these loans as a debt trap. These people who regarded loans as a blessing now refer to it as a mountain of borrowings. The Economic policy they advocate is not capable in taking the country forward. The strategies adopted in building up a national policy among the Sinhala, Tamil and Muslim nationals are inadequate. The policies adopted to establish law and order in the country, had never been helpful to establish them. A main task of any government is to levy taxes and fill up the government coffers. The government is vested with the power to manage these funds. This government without making use of these funds in a planned manner is engaged in frauds and irregular activities. Therefore it concludes that every government that came into power had wrong social, economic and political policies. Q Is there in any country a government that has fulfilled the JVP’s aspirations? It is not a question of satisfying our party, but an aim of satisfying the masses. Are the farmers satisfied, are the fisherfolk satisfied, are the public and private sector employees satisfied, are you as a journalist satisfied – it is not so. A government which cannot satisfy the masses cannot satisfy the JVP. Q The government says that they are more democratic than the former and also there is more freedom of speech. Any government in its initial stages is like this. Compare the first two years of the Rajapaksa government. There was a similarity. Take Chandrika Kumarathunga’s government. She came to power in 1994 and only in 1994 she started retracting. Whatever the government, they begin in this manner and when confronted with issues they try to trim the freedom allowed. It is the aim of the JVP to strengthen itself with other democratic forces using this time and the country situation. Who is reaping this freedom? The thieves use it to rob people and freely move about. Criminals have freedom to commit crime and freely move about. But the masses have no freedom to express themselves. When students get onto the roads they are beaten and/or Baton charged. The farmers are suffering due to drought and no steps are being taken to grant them redress. Q You vehemently criticized the former government and the Rajapaksa family. How many of those allegations have been proved? A-Whatever I said with regard to the former government activities and the present were based on true facts and evidence and if there was a very minute doubt about them I would not have brought it to the notice of the society. These economic policies are aimed at fulfilling the wants of a particular class of people. You visit the Welikada prisons. Is there anyone among the prisoners representing both these classes? We have visited the Welikada prisons to meet several of our comrades. QDoes the JVP think that instead of these two parties you would be able to take over the government? Should we or not? Q There is an allegation from the society that the JVP is not keen on forming a government, but instead prefers to be in the midst of the two parties and keep on criticizing them. It is not the question of simple party politics. A careful study is needed. In any country social changes do occur, but they do not follow a regular sequence 1, 2, or 3. They happen as political leaps in the society. Q It is clear from the complex JVP political beliefs, and to put it in the common man’s words, that you all are running after a mirage. No it is not so. Do not think that the masses are fools. They know that this government is robbing. People are aware that after coming to power this government is helping only those criminal gangs around them. People are aware that they are burdened with high taxes, and those who ruled the country for almost seventy years had imprisoned the country in a mountain of debt. There is an issue, we as a political force had not been able to gain power. At an election they consider one of the two parties as capable in assuming power. Being mindful of this position we are building up public opinion with the hope of gaining power at the next elections. Q The public confidence that Anura Kumara Dissanayake had prior to 08th January 2015 is greatly diminished now. I need not measure it. Q There were several allegations against you recently. We are not surprised by these activities of the Rajapakse group. Q But these allegations were not made by the Rajapakse group but by those who assisted you in bringing this government into power. Do not jump to conclusions. Wait till I reply. There is a threat to the existence of the Rajapaksa group. They cannot speak about frauds as they are the ones fully involved. They cannot speak about democracy as they were those who murdered the masses. They cannot speak about reconciliation in the country as they worked to create dissension among the communities. They cannot speak about good governance as they were the ones who led the country towards a dictatorial rule. 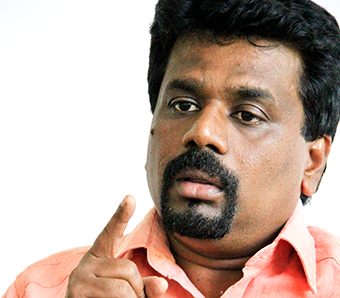 The JVP had posed a big challenge to the Rajapaksa rule. Therefore they are bent on hurling accusations that there is a relationship between the UNP and the JVP through me. Q There were accusations that you obtained money from several sectors under your party name. We brought down the rule of Rajapaksa and we contested in August to usher in a different rule. Q In politics you seem to be portraying the role of a person free of all the vices.